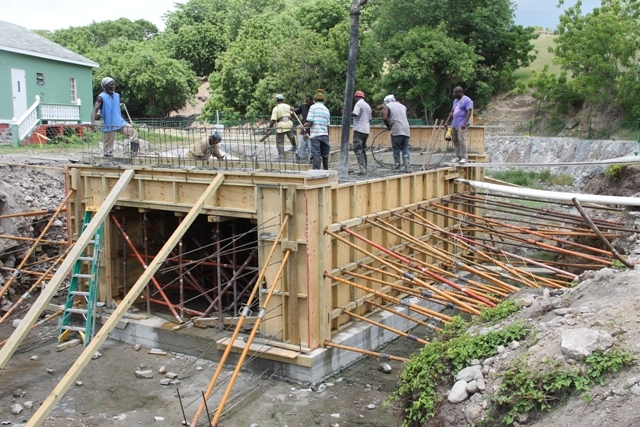 NIA CHARLESTOWN NEVIS (JUNE 19, 2017) — The Bath Village bridge got one step closer to completion, when concrete was poured for the walls, top slabs and sidewalks on June 16, 2017, for a new culvert bridge. It will replace the bridge which was demolished recently due to structural damaged after heavy rains. 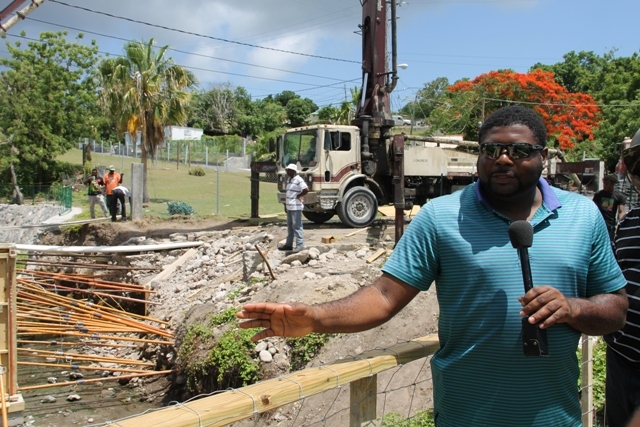 The Public Works Department (PWD) in the Nevis Island Administration (NIA) is supervising the construction. Director Raoul Pemberton, said the curing process for the structure is ongoing and the bridge is expected to be opened, 28 days after the concrete was poured. He said in the meantime, the wing walls, apron and head wall will be constructed for the re-installation of the road. The carriage way, new slipper drains at the entrance and exit, new pavements and proper walkways for the improved safety of pedestrians will also be constructed. The new bridge which will be 26 x 17 ½ feet, will measure 9 feet from the bottom. However, the internal height will be 6 ½ feet. Pemberton, used the opportunity to thank the persons working on the bridge for their diligence to ensure that the project is on schedule. “I would really like to thank the workers. They were the ones who were actually ahead and ensured that the work was done in a timely fashion with our supervision, of course. With their hard work, we were able to get to this stage. They have been working tirelessly,” he said. The Director also thanked the people of Bath Village for their understanding and assistance with the project. He said though there was some discomfort at the start of the project, they subsequently understood the importance of the construction being undertaken and have come and shared their local knowledge of the area with the department. Mr. Carl Claxton he said provided signage and Pastor Eversley Pemberton and the members of the New Testament Church of God on Bath Road gave permission for the property to be used as a temporary bypass as access for pedestrians accessing Bath Village from the Charlestown end. Meantime, Hon. 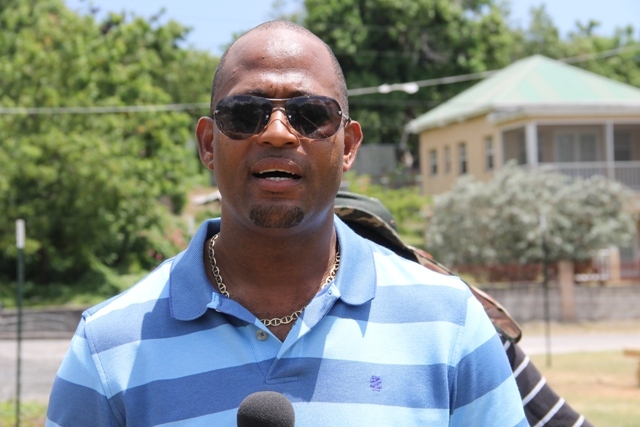 Troy Liburd, Junior Minister in the Ministry of Communication and Works who was also on the scene said he was pleased with the steady progress of the project and lauded all those responsible. He noted that the NIA has invested in a new bridge that is bigger and hopefully better than the previous one. The Junior Minister also thanked the people of Bath Village for their patience during the duration of the project. He also commended the Director and his team for the work they have been putting out. Mr. Daniel Williams Operations Manager at the PWD was also present.